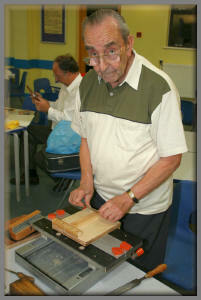 This evening’s demonstration is all about scrapers and scraping - and it doesn’t always refer to marquetry, you may even find some good uses for scraping with many other aspects of woodwork. Before we begin one thing I would like you all to think about is acquiring a bench hook - this is going to be very helpful to you for when you do any scraping. There’s nothing special in the make up of this bench hook, as I’m left handed I’ve placed a saw guide there on its left hand side and added one in the middle. 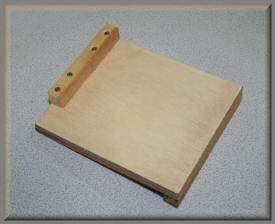 It’s a very helpful piece of equipment when you are involving yourself in various aspects of woodworking. It’s not at all difficult to construct, you can very easily make one, there’s nothing particularly special about it at all - as you can see it’s very simple! Anyhow – scrapers, you can get all sorts of scrapers for performing different tasks but, scrapers for cabinet work – that type – those are the ones we will be concentrating on for marquetry. I’ll show you all the types of scrapers that are available to the craftsman and we’ll go through them one at a time so that you get the idea of how they are used. 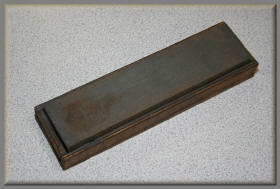 The first one we shall look at is the flat steel scraper. 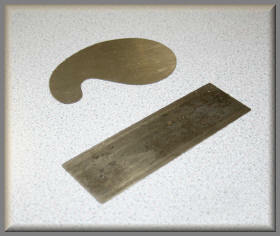 These are a flexible steel plate/blade roughly about 6 x 4” in size. They are made so that you can apply slight pressure in the middle with your thumbs to form a slight arc so that you can achieve a clean and accurate “cutting” action that removes very thin curls from your veneers without the scraper “digging in” to your work. Your only problem with this scraper will be if you have any arthritis in your hands, in which case you may have some problem in bending them, so if you find that you can’t bend them it’s best to avoid using these scrapers and use one of the others I’ll be describing later on. Now, if you are going to use one of these blade scrapers the first thing you’ll want to know is how to sharpen and prepare the scraper. So, let us firstly consider what this particular scraper actually is, it is just purely a steel sheet, at least that is what it remains until we perform some special preparations on it that will turn it into a very useful tool for us. So to prepare your scraper blade, firstly place it in a vice, or clamp it to your bench nice and firmly by some other means if you don’t posses a vice. Then get a file (about a medium grade one) and flatten both of the cutting edges of the scraper by running your file diagonally across the edge surfaces so that you remove any old burrs off and get the edges are as near as possible at 90° to the sides as you can make them. If you intend to use the steel scraper blade for your marquetry it’s a good idea to just round the outer corners of the scraper off because it will save it from digging into surrounding veneers. The next part of this process is to rub your filed scraper edge along an oil stone and that will take your file marks off the edge, then you can sharpen your scraper by whichever method you like to choose. "yes indeed, you are making a right angle which, if you put it under a microscope would look nice and sharp - and which you also have to set or burnish that edge to produce your cutting lip" "in fact you are making it curl round a bit? ", “yes that is right, but you can lose it's edge after a period of use so you will not then get your clean shavings off of it. 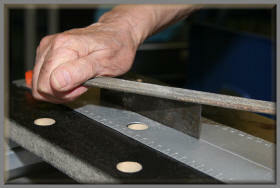 Alf then passes the filed and prepared scraper blade over to Bill Kober to inspect. Bill checks the scraper blade and comments at this juncture "I recollect that when Eric Horne demonstrated the technique a few years ago that he did not use a file, he just used a flat edge if I remember correctly" "ah yes, Eric may well have done such a thing, but you should really put a clean prepared edge on it, you have got to set or form the cutting edge. (as described in paragraph 1 above). Alf has made this one for left handed use. Right handed users will place the "gap" on the right. 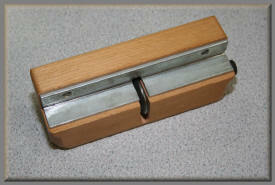 Another view of Alf's Bench Hook. There are three ways you can set your scraper blade. Place your scraper on the edge of your bench and with your burnishing tool at a slight angle pass it ONCE ONLY and no more over the edge of the blade. When you have set the first side, reverse the blade and form a cutting edge on the other side using the same method. You can, if you wish turn the blade upside down and form two more cutting edges so that the scraper blade has a total of four nice sharp cutting edges. This burnishing tool by the way is a hardened silver steel rod. If you do not have one of these you could at a pinch use a gouge or chisel if there is nothing else. There is another way of completing this process if you do not have a vice to hold the scraper. But I would advise you to take great care and use a piece of rag or something similar and hold the scraper in the rag and then draw your burnishing rod along the long corner so that you form a kind of lip along the edge - but do watch what you are doing and take care. 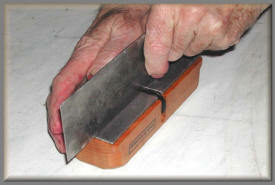 Filing the edge of the scraper blade flat. 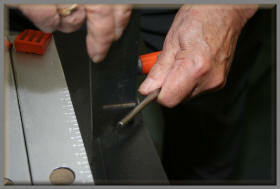 Using burnishing rod without the facility of a vice. The third way of forming the cutting edge is with this German burnishing and setting tool that has a steel disc which is set into it at the correct angle to form a cutting edge which will have the optimum angle for maximum cutting efficiency. The setting tool is very easy to use because all you do is basically lay the tool on your bench and just draw the scraper through to form the lip along it's edge, it is as easy as that. Now comes the big question, it is time to check the proof of the pudding and we are going to test those scrapers we have just sharpened. By the way, it's important to mention here that you just scrape with the grain you don’t do anything else. Let’s say that you have got your picture down on your work surface and that you are ready to begin scraping and you have got your 6” x 4” scraper ready sharpened and it’s raring to go, you will need however, to watch what you are doing and take great care because with a scraper of that size, which is about 6 inches or 15cms long, you could easily be touching other veneers’ (you know the surrounding veneers), so if you can manage it only try to scrape your one veneer because if you start using it wrongly it could touch the wrong veneer and you could very easily tear it up and then you’re going to be well and truly “for it”. 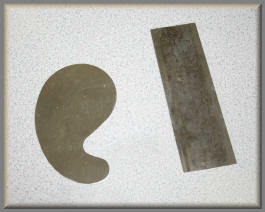 Clearing filing marks with the oil stone. in its box as shown in this photo. The "blade" scraper and a "Goose Neck" scraper. 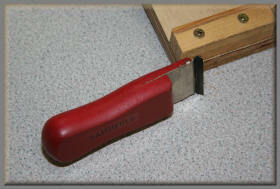 The German burnishing and setting tool. Your picture should be stuck down well before you begin and it also mustn’t have any blisters, so watch what you are doing if you are going to use any scrapers. So the next thing is testing those new sharp edges you’ve just been putting on, so that you should be able to get curled scrapings off instead of dust. The next scraper I am going to show you is a Goose Neck scraper. 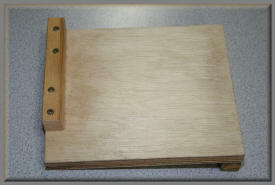 This is used mostly on mouldings or the edge of tables, legs or anything like that. I’ve just brought a spindle along to demonstrate it, but you wouldn’t use it on marquetry, so it’s no good saying you will because you won’t. So that’s one odd example. 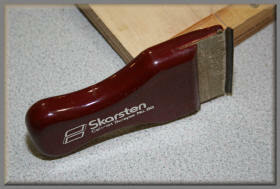 Another example is the Skarsten scraper which is a hooked scraper. It’s a bit big for marquetry, this one being about 4 inches or 10cms across, so if you’re going to use a scraper like this for marquetry - be careful once again of your surrounding veneers. You can get replacement blades for these so there is no need to worry about sharpening or anything like that. If you want to rub a file along it you can do. But they also do a small scraper like that, about 1. 5 inches or 4cms across, which I think would be ideal for you. 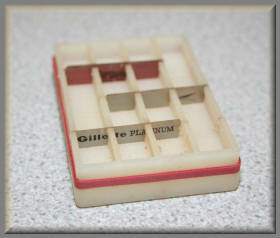 And, you will be pleased to know, you can also get replacement blades for it, so you’ll have no worries there! You can see how well they work when I scrape this test piece with them – there you are, perfect shavings. I shan’t pass these around for you to inspect as the blades are very sharp and we don’t want any accidents happening. But these are very simple to use I think you’ll agree. These small Skarsten scrapers are very good scrapers for marquetry, I can highly recommend them. They come with a spare set of blades and cost about £5. 00 each which is not a tremendous amount of money, so what more could you want? It certainly saves all that trouble of getting your flat steel blade scraper and placing it in a vice and filing it, then flattening it on the oil stone and setting it. This one is already set up for you! “Where would you get one from?” asks a member of the audience “I got this from Middleton’s in York Road. But I would recommend this, you’ve got more control over your marquetry with this because you can do accurate work with these – you certainly couldn’t with that large one, you would end up if not careful touching the surrounding veneers and tearing them and subsequently risk spoiling your picture, you certainly don’t want that to happen. By the way, I think I should mention here that the original Skarsten company seems to have gone out of business. A firm called Faithfull Tools is now producing more or less identical scrapers to those old Skarsten ones. I have tried the new Faithfull blades in the old Skarsten handles and they seem to fit perfectly you'll be happy to know! This next one is this rather an old one. In fact it is probably about forty years old whether it’s still in existence or not, I simply don’t know, I shouldn’t think so. It’s made up of razor blades, staggered razor blades to be exact, and the whole thing is held together by an arrangement of elastic or rubber bands in a somewhat Heath Robinson style, but still, you hold it like so (holding it in a black board eraser style) and you go against the grain but unfortunately you only get dust off! If you go with the grain you’ll end up with tram lines caused by the edges of the blades, so watch what you are doing with one of these. If you are starting off with rough wood and you are using one of these scrapers, get two used razor blades (they supply you with some) put them in between your fresh razor blades and that will be ideal for your rough work. For fine work you would use the normal blades as they are. They also give you a gadget that holds three old razor blades and assembles together for snapping the razor blades off, but anyhow I don’t think you can get those razor blades anymore – everyone uses disposable razors or electric ones these days. In fact I’ve got a leaflet here that came with this scraper which says they were selling blades at 8/-6d for 50 (that’s 42. 5p for 50 in today’s money) so that just shows you how old it is! middle section of the blade. This next one is a Stanley scraper, but it is rather wide and not suitable for marquetry – it is ideal for getting paint off of your windows and that sort of thing! But there you are that’s the ordinary Stanley scraper. Eric Horne, one of our late members, he made these next scrapers I am going to show you. They are very useful. He was a very talented craftsman was Eric, because all he used was a hacksaw blade ground down at the edge and fitted to a wooden handle. You used it in a similar manner to the Skarsten scraper and it was, and is, very useful for removing veneer tape and paper from your work, you can really use it however you like - “here are another two he made” interjects Dave Walker, “oh yes these are excellent" – “he made them from industrial power saw blades you know” yes, he was a real craftsman was Eric. I know some of you will have not seen his work, but his farmyard models and other equipment he made are absolutely marvellous. But however, if you wanted to make one of these scrapers yourself you will find that they are quite simple to make – you get a piece of old hacksaw blade and grind the teeth off then form a piece of scrap wood into a handle shape and make a saw cut to fit the piece of hacksaw blade in, then fit the piece of blade in the saw cut and bind it in with some tape wound tightly round that saw cut section so that it clamps the piece of blade in place nice and securely. And voila! Now you have got a scraper you’ve made yourself that is a really good and handy tool, I would really recommend that one. “If anybody does try to grind one of those blades down Alf, they have got to be particularly careful as they can shatter” Oh yes, if anybody’s not sure or unhappy about what they are doing, they have got to get someone who knows a bit about it to do it for them, don’t take chances. Another useful point about this tool, especially with this wooden handle is that if you are attaching banding, this is very useful for pushing it up against the edge, it’s a wedge shape and is very handy. Now here is, what may seem to you to be a very strange object to be considered to be classed as a scraper, it is a piece of broken glass! Some craftsmen consider this to be a very good scraper – and – they can, believe it or not, get some very good results with it. If you intend to use this idea I would recommend wrapping the glass in a piece of rag or wearing gloves. The last one I’ve got to talk about is a large double handled cabinet scraper, but as you can see it’s definitely not for marquetry. It works on the same principal as that flat steel scraper inasmuch as it needs to be used with a slight bend in the middle of the scraper blade to work correctly. I’ll show you how to set this one up – the first thing is to open it up and release the back plate and lose your blade, right, there’s your blade, its got two edges on it the same as your ordinary scraper. Put it in the back of the double handled frame, you can either rest it on your work like so, tighten up the screws and then with the thumb screw on the front start screwing it up until you form a bend in the blade. And that works, as I said, with the same principles as the normal steel blade scraper. 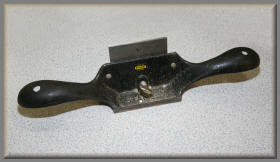 A small flat Swann-Morton number 18 blade. scraper. 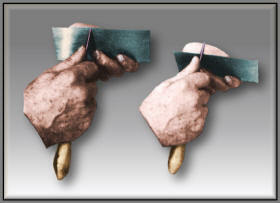 It is very handy for removing glue "blobs"
designed by Eric Horne as mentioned in the text. 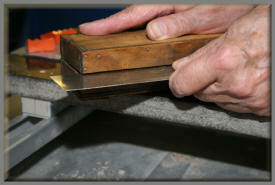 Using a sharpener rod to form the scraper edge. Now, I’ve got a piece of scrap wood here that I’ll demonstrate its uses on. As you can see it doesn’t remove a lot, but you can adjust the iron by raising or lowering it slightly as you would do with a normal plane iron – so that’s that scraper. “Yes Alf, with that first scraper, the steel blade scraper, do you have to bend it?” oh yes, as I said, if you have a bit of arthritis in your hands you may find it a bit of a job to bend – I mean you should be able to bend it a bit, rather like so, but if you can’t, well - “I’ve got one at home Alf but I can’t bend that!” well, as I said earlier on, if you are having trouble using the steel blade scraper, then these Skarsten scrapers would be your best bet, but take care if you are going to use the larger one for your marquetry as the corner edges could damage your marquetry if they catch on it, but with these you do get shavings off rather than just wood dust. “I’ve used a scraper to flatten this picture” says Harry. Oh excellent, I’ll show this to the group – now as you can all see here, Harry has used a scraper carefully and although the grain is running in all directions, he has had no problem at all with his use of the scraper, “yes, you’ve just got to be very careful” quite right, so there’s a good example of using a scraper without acquiring any problems. “After I’ve finished levelling it off with the scraper I use three coats of sanding sealer before I use sand paper to finish it off” – well there’s recommendation for you, use the scraper to level it, then apply three coats of sanding sealer and finish it off with your sand paper, thanks for the information Harry. “Here’s a piece of turtle shell Alf, will it respond to the scraper?” – Right, well we have a piece of turtle shell here that I am going to see how it responds to the actions of the scraper. It’s working quite well, we are getting some good shavings from it, so that’s a good example there of how a scraper can be used to successfully treat something quite different from wood. The audience applauds - and then end of the demonstration.